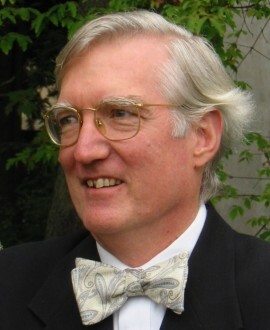 Musicologist and music historian J. Evan Krieder began teaching at the UBC School of Music in 1975. Kreider’s research encompassed studies of Renaissance chant, early music notation, recension of manuscript and printed sources, liturgical music, and the editing of Renaissance and Baroque keyboard music. Other projects included a critical edition of the secular works of Pierre de la Rue (d. 1518) and the investigation of politics and theology in music attributed to Martin Luther. He is co-editor of La Rue’s Opera Omnia, and has published in the Corpus of Early Keyboard Music, Musica disciplina, Notes, Renaissance and Reformation, and elsewhere. He also hopes to assist the Development department meeting potential donors for Music and Arts, as one way to support UBC during his post-retirement years. He suspects that his wife Janice will enjoy eating breakfast unaccompanied by Music 120 lecture music examples.